Samsung and AT&T have officially announced the upcoming launch of the new powerful, long-awaited Samsung Captivate (also known as Samsung Galaxy S) Android-powered smartphone, which comes equipped with an array of impressive features including speedy 1GHz Samsung Hummingbird Application Processor, 4-inch WVGA Super AMOLED touchscreen, 5 megapixel AF camera with 720p HD video recording, Samsung Social Hub, Wi-Fi b/g/n, Bluetooth 3.0, huge 16GB on-board memory and Android 2.1 platform, compatible with AT&T’s HSPA (High Speed Packet Access) 7.2 Mbps technology. In addition, Samsung Captivate that incorporates a virtual full QWERTY keyboard with Swype technology is also featured with a 6-axis sensor that combines the built-in accelerometer and gyroscope for ensuring a smooth, amazing gaming experience. Samsung Captivate that supports AT&T Address Book Internet service and DLNA (Digital Living Network Alliance) media sharing is expected to be available exclusively from AT&T in the near future, but no words on its launch date and pricing details yet. 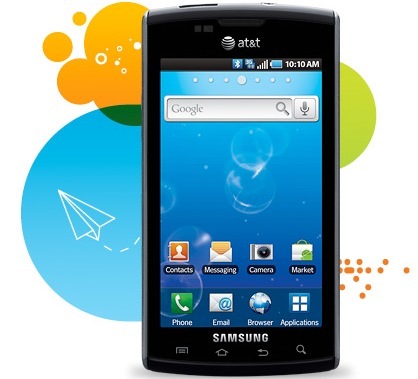 Update: Samsung Captivate will hit AT&T stores in coming July 18 for around $200 with service contract.